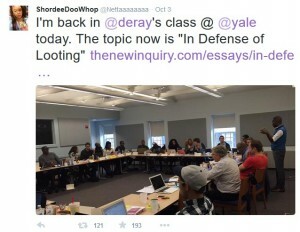 Recently the Allen West Republic and Weasel Zippers discovered a controversial topic being taught at the Yale #blacklivesmatter course. The topic was “In Defense of Looting”. Throughout the day, a woman that goes by the name ShordeeDooWhop on twitter tweeted various statements from the day. Looting is the illegal process of stealing from people and or businesses during a time of riots or war. It is usually performed by the local thugs in the community and is not limited to any race. People who loot are criminals, criminals commit illegal activities, those activities are illegal for a reason. Looting is dangerous for everyone involved, the looter, the bye standers, the community, and the property owner. It is using the circumstances to engage in violent theft. 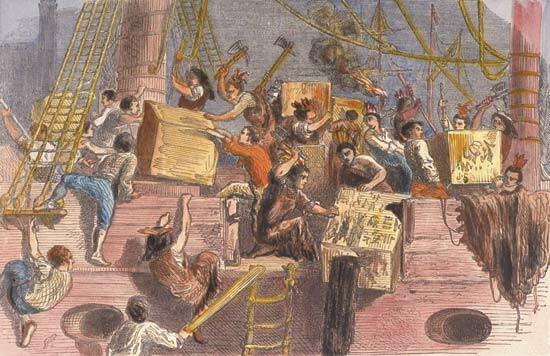 Can you compare Looting to the American Revolution? The simple answer is “only if you have an IQ under 50”. Most people that loot couldn’t put a 3rd shift in at the local Mcdonalds let alone rebel against tyrants and form their own country. The fact that nobody in that room could give a better response when the comparison was made between looting and the revolutionary war makes me question the universities academic requirements. I personally feel that my cat could come up with a better answer than “You got me”. One of the main reasons for the desire to rebel against England was “High Taxes”. In order to get angry at high taxes you have to be gainfully employed. This is a requirement that most modern day 2015 looters fail to meet. Those who fought in the Revolutionary war fought for a better way for their families and future country. Those who loot in 2015 are looking to take advantage of a negative situation to score a few free items for the local store. Historians have long pointed out that Yale (the University) is deeply implicated in the institution of slavery. Many of its prominent buildings are named after slaveholders or slavery apologists. It housed so many southern students that it briefly seceded from the Union at the start of the Civil War. 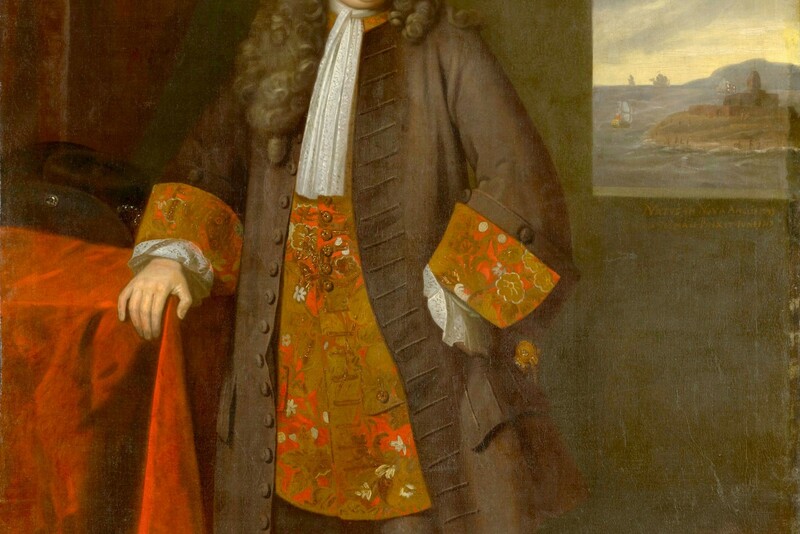 As an official for the East India Company in Madras (present-day Chennai), Yale presided over an important node of the Indian Ocean slave trade. Much larger in duration and scope than its Atlantic counterpart, the Indian Ocean trade linked southeast Asia with the Middle East, the Indonesian archipelago, and the African littoral. On the subcontinent, it connected with and drew upon traditions of slavery and servitude that had flourished for generations. 4 In the 1680s, when Yale served on the governing council at Fort St. George on the Madras coast, a devastating famine led to an uptick in the local slave trade. As more and more bodies became available on the open market, Yale and other company officials took advantage of the labor surplus, buying hundreds of slaves and shipping them to the English colony on Saint Helena. Yale participated in a meeting that ordered a minimum of ten slaves sent on every outbound European ship. 5 In just one month in 1687, Fort St. George exported at least 665 individuals. To read more of the Yale Founder’s Slave Trading Adventures read this well written piece by Joseph Yannielli.